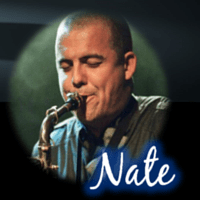 Nate Ketner has been playing the woodwinds professionally since he was 19 years old. Throughout his musical career he has developed the ability to authentically play many different styles with an emphasis on jazz from the 20’s to the 50’s. He has performed with popular festival bands such as the Reynolds Brothers, Meschiya Lake and the Little Big Horns and the Bluestreet Jazz Band.